Due to the lighting effects, monitor settings, etc. For Salt Water / Marine Aquariums. most salt water / marine aquariums. This can be allowed for by the aquarist but only if they are aware of the difference. A New finer scale running from 20-40ppt salinity (SG 1.015 - 1.030). Specific gravity S.G. No electric or batteries required. 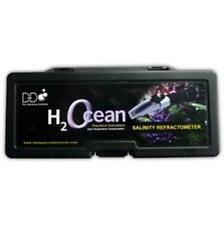 For marine saltwater aquariums. Tests salt levels. Due to the lighting effects, monitor settings, etc. People always bought together with. An Easy Way to Gauge Aquarium Salinity at a Glance. As such, we have a huge wealth of experience in online trading. At present we list nearly 5,000 specialist aquarium & pet products suitable for Aquatic, Reptile, Cat and Dog enthusiasts. Use - Float in Water to show Salinity & Temp, Green section = correct range. For Marine or Tropical / Coldwater. Material - Glass. Range - 1 - 14 ph. Air bubbles which are attached to pointer must be dislodged to obtain an accurate reading. Temperature corrected readings. Rinse with tap water and let air dry. Read specific gravity on inside scale, and salinity in part per thousand (ppt) on outside scale. Due to the lighting effects, monitor settings, etc. Good quality! Excellent Service! The sera aqua testbox marin contains the following test Marke Sera. Marine fish and corals require stable water conditions, which makes regular checking of salinity important. It's also necessary to check salinity when making up new water for water changes. The average density of a sea water aquarium should be between 1020 and 1024. Join us on our website. EAN 8023222024434. Marine fish and corals require stable water conditions, which makes regular checking of salinity important. It’s also necessary to check salinity when making up new water for water changes. Easy to read. Green safety zone for both temperature and salinity. 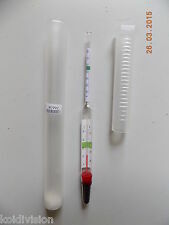 - Specific gravity range: 1.000 - 1.060 (Normal Salt Water range: 1.020 - 1.026). Marke Evolution. Density spindle. For an exact find density of sea water. Pointer to the fill. - Easy to use. As in an aquarium the salt content must be kept constant, to check it regularly. Without specific indications, the point nearest relay proposed by Mondial Relay will be chosen by default.